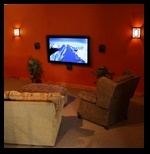 for best technical design from CEDIA & the Chrysalis National Award for Best Home Theater. majority of blockbuster films are created in. and other professional multi-media activities. or add a digital sign for your business.